The Resident Evil franchise has seen its fair share of highs and lows over the course of its 20-year history. While the earlier titles established the series as a revitalization of ambient survival horror first seen in Alone in the Dark for the PC by Infogrames, The last three titles have been more akin to horror-themed action games that owe more to the cover-based shooters of old like Winback: Covert Operations and Kill Switch. With Resident Evil 6’s willingness to forsake all the tenants that made the series special and adoption of a multiple campaign system, it is easy for one to see the issue. In one of those rare instances in which art imitates life, Resident Evil 6’s biggest revelation is that the franchise was suffering from a severe identity crisis. With this preliminary historical context out of the way, how does this latest entry hold up on its own and where does fall into the franchise as a whole? Thankfully, Capcom has made a triumphant return to the world of survival horror with Resident Evil 7. With its hauntingly beautiful visuals and stellar aural presentation impeccably married with the themes of horror and underlying misery, this outing’s atmospheric qualities truly stand out in a big way. 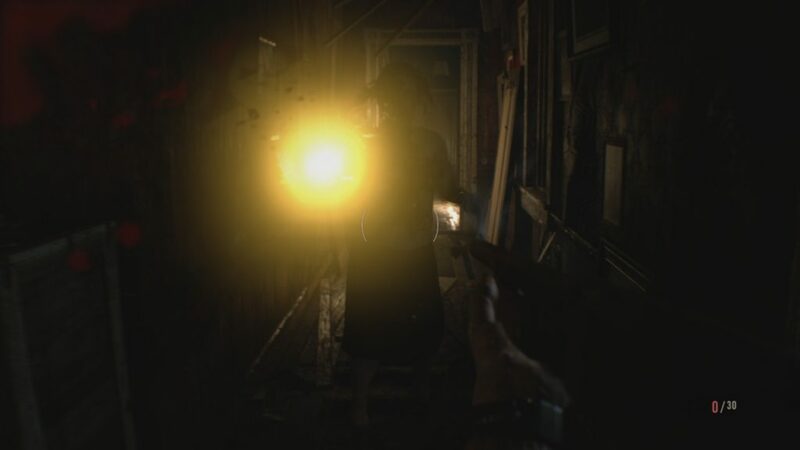 It also successfully ties all the franchise’s traditional survival horror elements together and houses them comfortably within the first-person perspective. It is not perfect, as a couple of technical issues can slightly detract from the overall experience at the worst of times. Despite these minor hiccups, Resident Evil 7 still emerges as a modern masterpiece of survival horror gaming in its own right while being able to proudly stand among its forbearing brethren. With how bloated and convoluted the Resident Evil canon has become as of the release of the sixth mainline game, it is pleasantly surprising that Resident Evil 7 centers its story around a brand new cast of characters and locale. Like the vintage Resident Evil titles, RE 7 takes some inspiration from classic horror cinema and puts quite a twist on those previously established conventions. Enter Ethan Winters, an average man searching for his estranged wife Mia who went missing three years ago. After receiving an unexpected Email from Mia, Ethan travels to her supposed location being the Baker Estate in Dulvey, Louisiana to find her. Upon finding her, Ethan eventually realizes that something is horribly wrong with Mia, as she has a condition which gives her superhuman strength and homicidal insanity. After a failed escape attempt, Ethan is incapacitated and taken captive by the Baker family that happens to suffer from the same disease as Mia. The Bakers have a sick fascination with wanting to infect their victims with their disease and make them “part of the family.” With the help of a secretive lady who contacts the protagonist via phone calls, it is up to Ethan save Mia while unraveling the mysteries of the Bakers and their dilapidated estate. The story of Resident Evil 7 undeniably pilfers elements from classic horror films like The Hills Have Eyes, the very first Texas Chainsaw Massacre and even Evil Dead 2. However, the game deceptively wears these tropes on its sleeve during the first quarter of the experience in order to hide what is truly happening in this well crafted yet horrifying region. This title cleverly employs themes and concepts both scrapped from and implemented in the final version of the first Resident Evil in order to tell its story and aid in its world building. 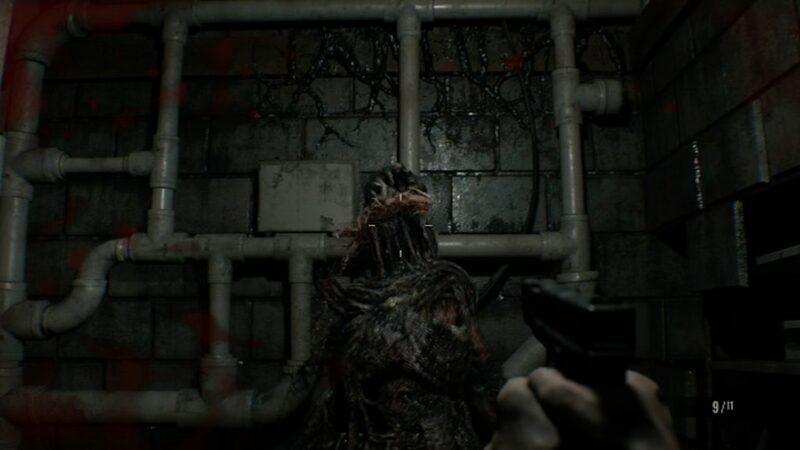 RE 7 takes things back to basics and adopts two themes from the original being horror and underlying misery and uses these concepts to solidify these themes. Like the first title, Documents, personal journal entries and photographs littered throughout the environment help the player to weave a narrative that tells the whole tale. This is also helped along with a scrapped concept of RE 1, which is the use of messages written in blood and environmental dressings. The storytelling with its plot twists is very impressive and rewarding to the player if he or she is willing to explore and be inquisitive. Despite the dark nature of Resident Evil 7, there are some laughs to be had from Ethan’s reactions to some of the unbelievable things occurring around him. It is definitely reminiscent of the cheesy and groan-worthy dialogue of the older titles and helps offer some moments of levity. This definitely helps to contrast with the violence depicted herein, which is totally raw and grizzly to say the very least. 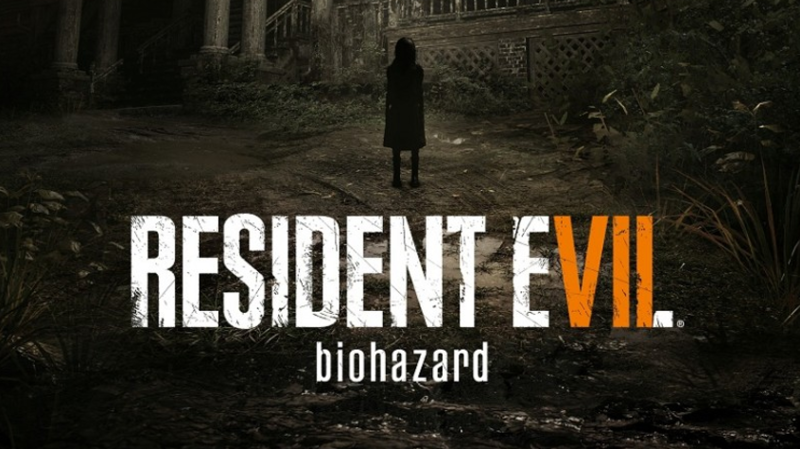 Much like the earlier entries in the series, Resident Evil 7 revolves around the exploration of the environment, inventory management, puzzle solving and engaging in combat with the mutated adversaries of the Baker Estate. This is all handled within the first-person perspective, a design choice cut from the first Resident Evil during its early development. 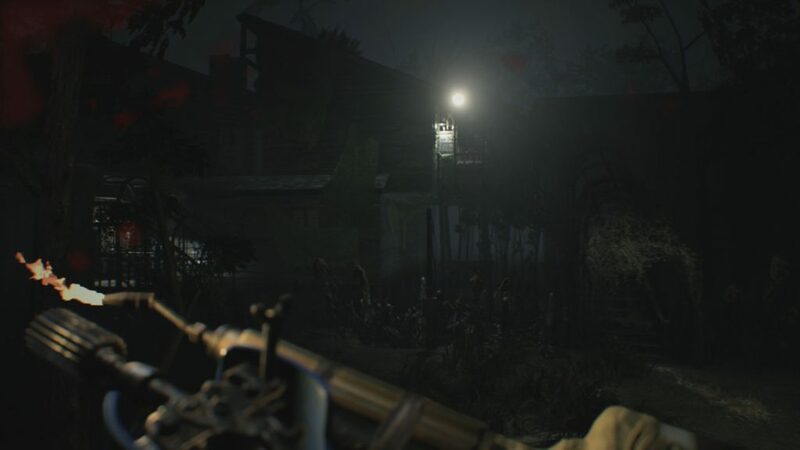 Returning to the true survival horror roots of the series, this latest outing rewards the player’s exploration and investigation of various areas in the form of weapons, precious ammunition, means of unlocking new areas and healing supplies. Lockpicks make a return as does the concept of having theme-focused keys that unlock specific rooms, which works in the methodical progression of overall experience. Combing every nook and cranny of the disheveled mansion and its accompanying buildings is imperative in order to piece the story of the game together as previously mentioned, but being able to locate scrounge for anemic caches of ammo and first aid is what is truly going to keep the player going his or her first time around. With that, another interesting mechanic scrapped after the release of the first numbered title shines through and that is the investigation of interactive objects in full 360° 3D. This lends itself to quite a few welcome acquisitions of helpful items as well as clues that add further context to the twisted history of the Baker family. It also falls in line with a clever use of the RE Engine’s implementation of lighting that makes for some solid puzzle solving. 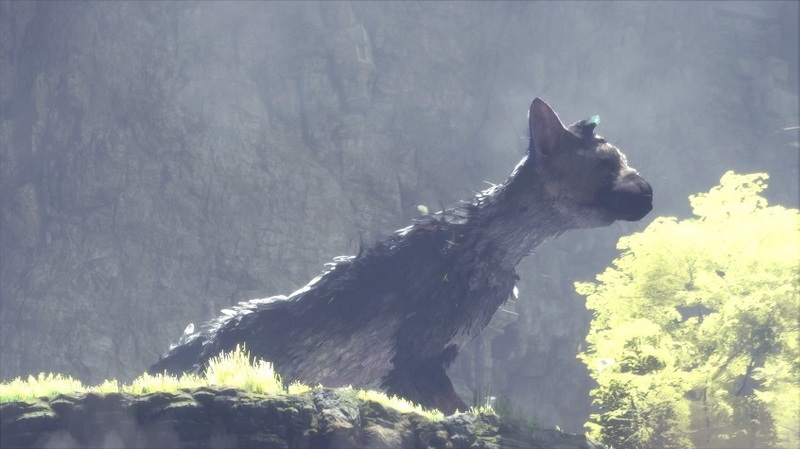 There are some areas of the game that present the player with a light box projecting its light against particular still life paintings of animals. Matching the shape with a cast shadow will solve the enigma, but it is up to the player to present the object and orient it properly to cast the right shadow. It is really satisfying to lock the shadow into place and see the wall shift to reveal a secret passageway or secret chamber. Other puzzles include callbacks like finding the previously mentioned themed keys to open doors adorned with like dressings, finding cranks and valves to create makeshift bridges and handle fluid control. One section of the game is seemingly designed by one of the more inventive members of the Bakers and it really tests one’s abilities in this area. You may actually find yourself jotting some notes down like the ‘good old days’ in order solve some of the puzzles this game throws at you. It is great to see this element return to the series and do so in a meaningful way that shows a high level of polish and makes sense. 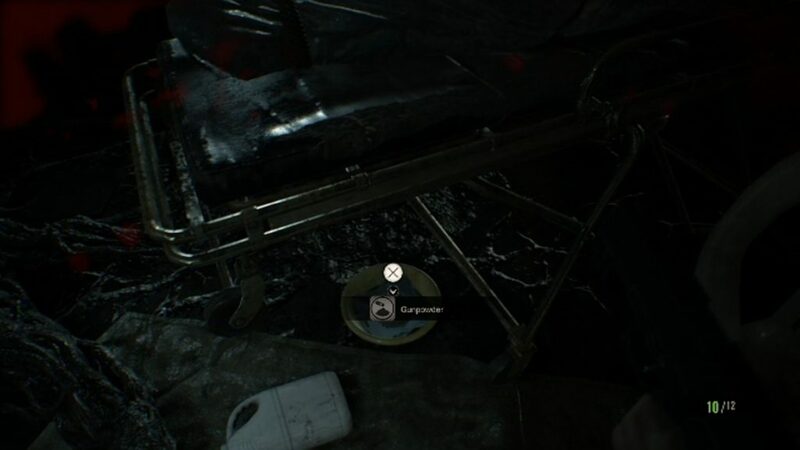 Another feature that plays an important role in RE 7 is the discovery of VHS cassettes that serve as fully interactive sequences that the player can physically play out. He or she plays these scenes as the specific character who originally shot the footage. These tapes help with puzzle solving and fleshing out the story by forecasting information through past events. This “found footage” approach is a fantastic evolution of the age-old concept of finding photos and documents to flesh out the game’s story that just adds to experience’s macabre flavor. 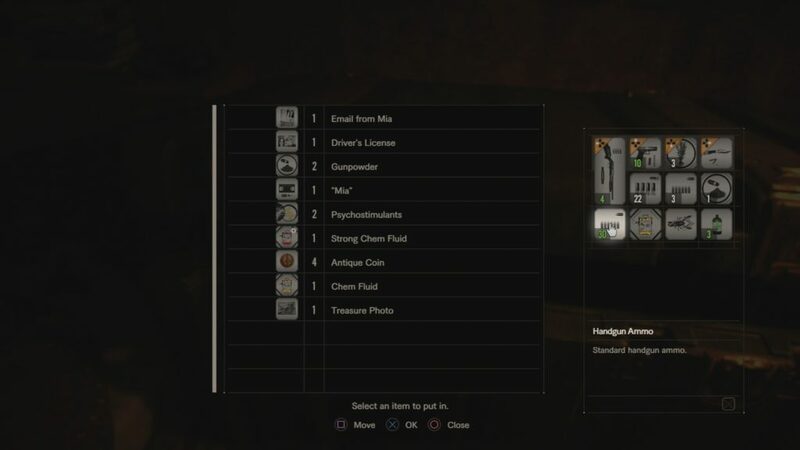 Having to juggle these puzzle-focused items along with your healing supplies and ammunition with only so much space at your disposal means that inventory management has also returned along with some welcome features taken from Resident Evil 3: Nemesis. On top of finding first aid and ammo, you will eventually come across bare ingredients in the forms of chemicals and raw materials. Coming across gunpowder and mixing it with a basic chemical fluid will yield handgun bullets. Other raw items mixed with regular and/or strong chemical fluids can result in quickly accessible first aid supplies and precious ammo for a few weapon types. This is a great inclusion because ammo is scant enough as it is, but being able to do some basic chemistry along with managing your inventory comes with a catch. Accessing the inventory menu and taking a gander at maps to navigate the environment all occur within real time, so making sure one is out of harm’s way or being able to act on one’s toes is imperative. This comes heavily into play when engaging in combat with the Baker family members and their mutated byproducts. The combat of Resident Evil 7, like other aspects detailed thus far, is well crafted and has a chilling intimacy about it. The way various skirmishes play out with the Bakers and their zombie-like creatures simply dubbed the Molded easily fall in line with the core ideas established in earlier entries. These situations are designed in a way that provokes the player to decide between fight or flight on the fly. Even if you tend to excel at taking down enemies, it is often times more beneficial to avoid them all together in an effort to conserve ammunition. This conservation most certainly comes in handy, as there are boss encounters littered throughout the experience in which retreat is not an option. The ranged and melee mechanics are tight when engaging in combat with any adversary and afford the player some avenues not seen in previous installments. Whether it is a fight with the Bakers or the Molded, landing shots and blows to the head will deal the most damage. However, there are other ways to take care of the shamblers. 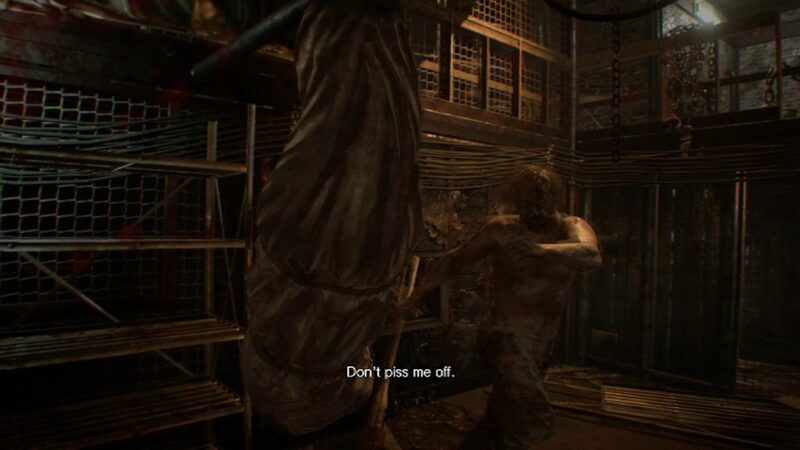 RE 7 adopts the strategic dismemberment ethos from the original Dead Space on top of the standard head shot, making it possible take out limbs in order incapacitate the various types of Molded of which there are three. Finally, being able to block against attacks adds a welcome tactical advantage to the combat, allowing the player to avoid taking significant damage as well as avoid his or her aim being hindered from violent flinching animations. Enemies can still be shaken off by pounding the action button, but you can still defend yourself if knocked to the floor. The game presents you with a “last stand” mechanic offering a window of opportunity to get a few shots in. Three are even some situations in which you can use part of an environment to your advantage. 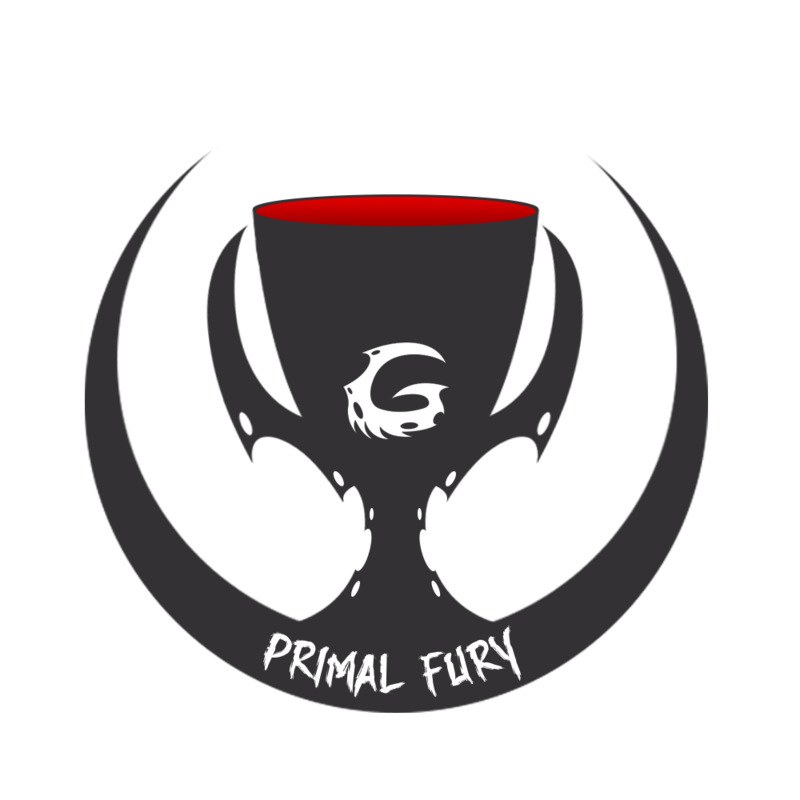 This title gives player a great deal of options for combat while still hammering home the feeling of helplessness emphasized by maniacs and monsters you will have to contend with. The regular molded simply saunter towards the player and tend to slink about, making it somewhat difficult to go for the head shot. Some of them have larger claws which deal heavier amounts of damage. There also exist smaller and spry Molded that stay low to the ground, leaping into the air to attack much like the Lickers first seen in Resident Evil 2. They are harder to hit, but they are pretty weak. The third type is almost reminiscent of the Bloaters seen in The Last of Us, spewing toxic projectile vomit and being harder to take down. 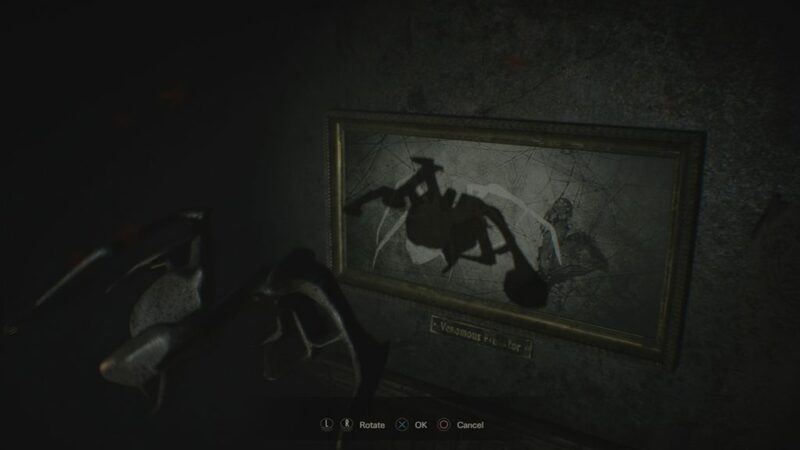 This all, unfortunately, means that there is a lack of visual variety in the monster design of Resident Evil 7, but what they lack in visual distinction is made up for in the way AI and general behavior. The bakers, especially Jack, fill that spot of Mr. X or the Nemesis in the sense that they barge in at the worst of times when you think you are safe. Other nuisances include insects and booby traps courtesy of Lucas Baker. All of these adversaries and pitfalls make for a solid yet reasonable challenge that melds well with combat possibilities afforded to the player. This will be something to keep in mind upon future playthroughs which can unlock new difficulties like Madhouse and some special items if the player can get through the game quickly enough. The slight replayability is a nice inclusion to an overall linear experience. With the difficulty and unpredictability of the combat, it is important to save often using the tape decks littered throughout the estate. 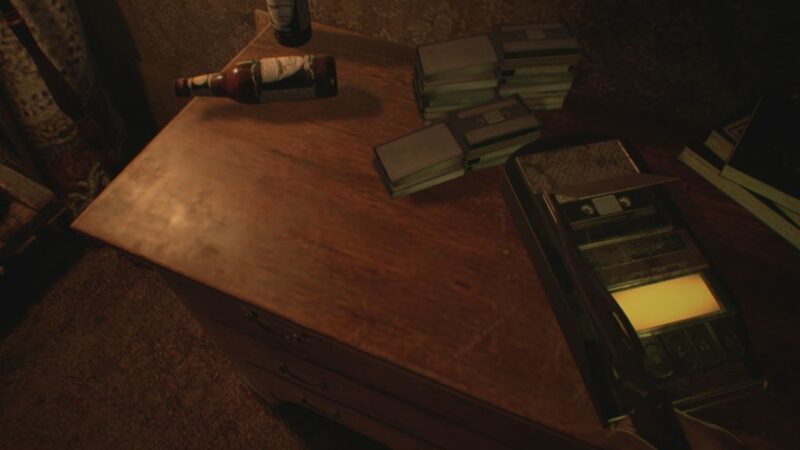 When playing on the normal or easy difficulty you can save as many times as desired, but playing on Madhouse difficulty requires the use of finite tapes to save in classic Resident Evil fashion. 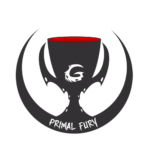 To further ease the penalty of death the game will checkpoint at pertinent spots and will even allow the player to manage his or her inventory with full access to the universal item box just before a boss encounter – a great touch. The artistic style and how it is realized in Resident Evil 7 is very impressive with its commitment to establish the Baker Estate as a believable place. The attention to detail seen in this title is absolutely staggering and it actually helps tell the story of this setting on top of filling the player with a feeling of dread and mortal danger. All of the set dressings seen throughout the mansion and adjacent homes are organic in their arrangement and make these areas feel lived-in and inhabited by a bunch of shut-in hoarders. RE 7 employs the use of photogrammetry for many of its assets and heavily relies on the RE Engine’s implementation of lighting and it shows in a big way. The whole macabre nature of this twisted place is fully realized and it is pleasantly creepy. The visuals, as solid as they are, also have a role in telegraphing things to the player like new areas of interest and possible enemy encounters. The post processing effects and filters used in VHS sequences are great touches that add a cool element of realism to these sections. This attention to detail also applies to the people and creatures therein, as they animate in a way that is disturbing yet conceivable. The bodies of the Molded pulsate and contort in unnatural ways in an effort to disturb the player and be difficult to hit. The Bakers looks impressive as well with how they meander about and toy with the player. Getting in close and personal reveals nice detail in facial animations and a rendering showing just how psychotic and grotesque these folks truly are. Some technical issues aside, the visuals of Resident Evil 7 are beyond impressive and cement the game’s setting along with its music and sound design. The soundtrack of Resident Evil 7 is not something you will end up listening to in your spare time, but it is surely perfect for its intended purpose. Most of it consists short preludes and interludes that help to offer some added emotional weight to what is happening. 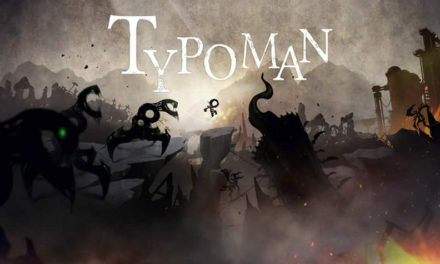 The soundtrack is dynamic and actually can telegraph to the player if he or she is in danger. 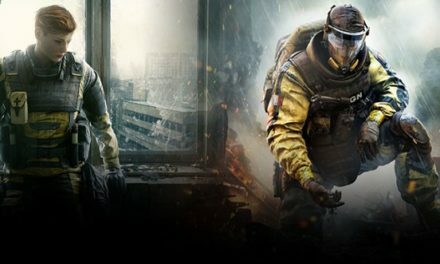 When the tense music starts revving up you know it is time to stop fumbling about with your inventory and be ready to defend yourself. The truly awesome thing with this game is its sound design that does just as much to complement the established visuals as it does feed into gameplay. RE 7 is an awesome symphony of ambient noise that does not let up for anything. The constant creaking of wood, distant chatters and groans heard are unrelenting reminders that you are always in a place you do not want to be. Resident Evil 7 would not be as fun to play or as terrifying without this core competency being up to the same standards as its gameplay and visuals. On a stock PlayStation 4 console Resident Evil 7 runs impeccably well. Even during sections involving combat with multiple human sized enemies or a large-scale boss battle, the game runs at a solid 60fps without a hitch. This is surely attributed to the fact that Sony requires any game with PlayStation VR functionality to run at a solid 60fps. On the other hand, the game struggles with texture pop-in between low-resolution placeholder textures and their higher resolution counterparts. This is a bothersome issue by itself, but the fact that this issue follows a rather long loading time upon staring a game and transitioning from a VHS sequence is hard to ignore. At times it may take seconds for the texture to load and that is if it loads at all provided that it is at the center of the player’s camera. Sometimes these textures will revert back to the low-res versions for some reason and it all sticks out like a sore thumb. The pacing of Resident Evil 7 works more than it does not. Instances of backtracking aside, the overall experience’s pace follows a fairly logical through line. This pretty much goes without a hitch before the tanker section, which tends to feel like a slow slog at times. It is understandable why it exists, but it could have been handled a little better. It is unfortunate that these issues exist because they are the only blemishes that hold this title back from being immaculate in its design. Capcom and its team have clearly created something special with Resident Evil 7. 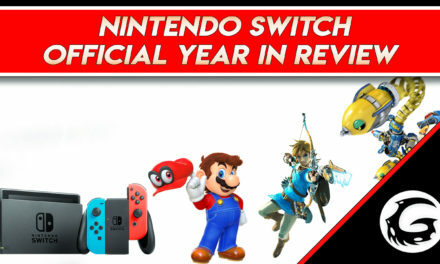 It represents a masterful return to the true roots of the franchise with the adoption of classic ideas with a modern implementation. While it pays respect to the games that started it all, it changes up the formula enough to be solid unique experience in its own right. Despite a couple of rough edges, this is a masterpiece of survival horror and one that any fan of the genre is bound to enjoy. Welcome back to the world of survival horror. His title says it all, Jon Rivera started his venture at gaming instincts as an assistant editor, and later demonstrated his talents in video and sound editing and quickly found his calling at Gaming Instincts, Jon is a passionate of all things retro gaming, his vast knowledge of the subject is at the lifeblood of all things retro at gaming instincts and it is sure to please anybody who reads his articles!